Do you use your bag comfortably? A bag has been used as a common life tool since the dawn of time and it is an essential tool for our daily life as well. However, the design itself as a pouched shape has not been changed much from a jute bag in the primitive times to a brand bag in the modern times. And because of the design, it holds a fateful inconvenient usage as things in a bag falling toward the bottom to make a mess. Your bag will be reborn with "Dellsatto!" 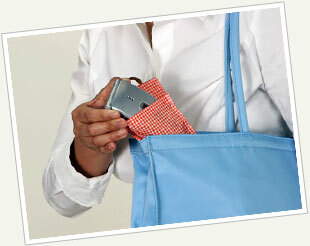 "Dellsatto" as a bag inner pocket is born to solve the inconvenient usage for such bags. 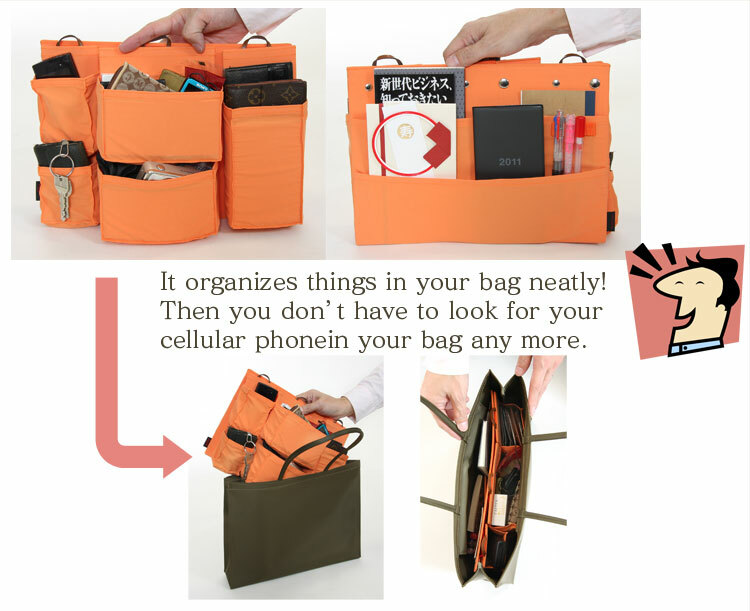 The front pocket is arranged as a dimensional pocket and things can be organized and held conveniently in your bag. Furthermore, things can be easily taken out because each line can move up and down. We will deliver this product with its reliable quality as all made in Japan. 1.Pocket - Easy to organize and take out things. The opening section always opens widely and since a bag does not fall on its backside, it is extremely smooth and comfortable to take things out from a bag. 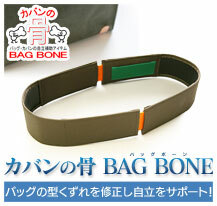 Because the pocket uses a soft material, it changes its shape flexibly in accordance with things in a bag. With having a special character for storage at each pocket, you certainly feel how you can use your bag more easily when you decide its fixed position. 2. 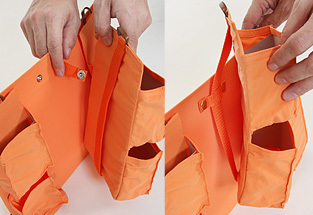 The pocket can be moved for up and down and let you take out things flexibly. The pocket can be moved largely for up and down by each line like a movement of desk drawer so you can easily take out things from your bag. 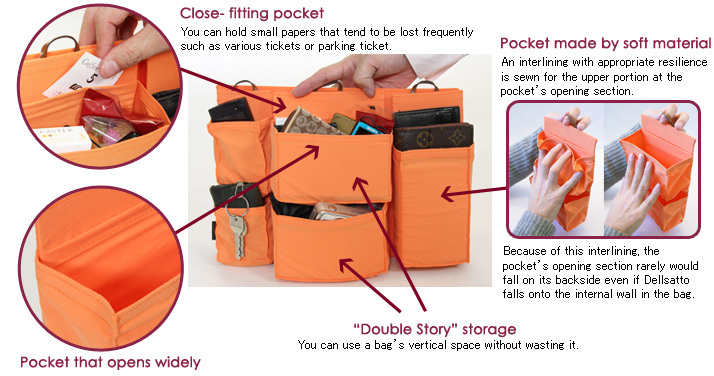 The design of movable pocket is this easy! Only vertical and horizontal belt are just crossed. You can take it off easily due to the hook-closure. 3.A large storage space created in the back. Dellsatto itself becomes a divider in the bag. Because it has the design of pocket rising upward, you don't need a movement for putting your hand into the bag. Since you don't need to do so, the front portion of Dellsatto can be used as snuggling it up to the bag's internal wall. In doing so, a larger available space can be created for the back. Dellsatto as seeking for lighter weight is approximately just 200g. The weight is just about a weight of one novel book. We designed the product for maximum lightweight while we reduce any burdens for users and secure a storage holding function. 5.Keeping a beautiful bag shape. For example, a soft leather bag. Have you experienced sadly losing a bag shape when you put something into it? If you use Dellsatto, it can keep a bag's shape as it is. So Dellsatto can solve such problem at once. Looking for a thing at the bottom of bag by putting your hand into it is troublesome and does not look good. You might give others not quite a good impression for your personal character or your job ability. 7.Easy to change a bag. When you want to change your bag in accordance with TPO (Time, Place, and Occasion), have you experienced not being able to change the contents of your bag swiftly due to its difficulty to change? 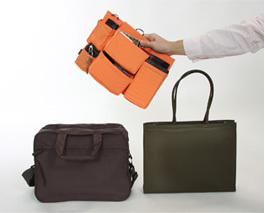 If you use Dellsatto, you can swiftly and easily change the contents whenever you want to change your bag. Then you can reduce the frequency of the things left behind. 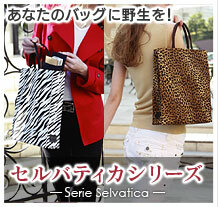 The inner bag of "Dellsatto" can be selected from 3 types in accordance with various life scenes and your current bag. It is a good match with various bags such as business bag, tote bag, shoulder bag, diaper bag, carrier bag, and overnight bag, and also can be used as a bag-in-bag.